Both aldosterone and luminal vasopressin may contribute to the maintenance of acid-base homeostasis, but the functional relationship between these hormones is not well understood. The effects of luminal vasopressin likely result from its interaction with V1a receptors on the luminal membranes of intercalated cells in the collecting duct. Here, we found that mice lacking the V1a receptor exhibit type 4 renal tubular acidosis. The administration of the mineralocorticoid agonist fludrocortisone ameliorated the acidosis by restoring excretion of urinary ammonium via increased expression of Rhcg and H-K-ATPase and decreased expression of H-ATPase. In a cell line of intercalated cells established from transgenic rats expressing the mineralocorticoid and V1a receptors, but not V2 receptors, knockdown of the V1a receptor gene abrogated the effects of aldosterone on H-K-ATPase, Rhcg, and H-ATPase expression. These data suggest that defects in the vasopressin V1a receptor in intercalated cells can cause type 4 renal tubular acidosis and that the tubular effects of aldosterone depend on a functional V1a receptor in the intercalated cells. Aldosterone and vasopressin regulates the acid-base balance by proton secretion through reabsorption of bicarbonate and the excretion of ammonium and titratable acid mainly in the collecting ducts.1–4 Principal and intercalated cells are present in the collecting ducts.1,2 Vasopressin regulates sodium and water transport via the V2 receptor (V2R) in the basolateral membrane of the principal cells and subsequent activation of aquaporin 2 and amiloride-sensitive epithelial sodium channel (ENaC), which is also regulated by aldosterone.5 Although vasopressin is known to act as an anti-diuretic hormone, findings regarding the effects of luminal (urinary) vasopressin have shown that luminal vasopressin acts as an intrinsic diuretic and regulates the anti-diuretic effects of basolateral vasopressin.6 The effect of luminal vasopressin has been thought to be caused via V1a receptor (V1aR), probably in the luminal membrane of the intercalated cells, given that V2R is not present in the luminal membrane of the collecting ducts.6–9 Although V1aR has been thought to perform an important role in acid excretion in the collecting ducts, the mechanisms and its interactions with aldosterone have not been elucidated. Aldosterone regulates acid excretion by the intercalated cells where vacuolar H-ATPase, H-K-ATPase, Rhesus blood group C glycoprotein (Rhcg), anion exchanger 1 (AE1), and pendrin exist.1,2,10,11 Thus far, many functional defects of these transporters have been hypothesized to cause distal type or type 4 renal tubular acidosis (RTA).12–17 Type 4 RTA, which is a hyperkalemic distal RTA, is known to be caused by hyporeninemic hypoaldosteronism.17,18 Although the treatment of patients with type 4 renal tubular acidosis by fludrocortisones has been shown to ameliorate acidosis, the precise mechanisms of type 4 RTA have been unknown.18 We have found that the deficient of V1aR causes hyporeninemic hypoaldosteronism.19,20 Therefore, we investigated acid-base balance in mice lacking V1aR (V1aR−/−). Furthermore, because the target site of aldosterone for acid-base regulation is the intercalated cells of the collecting duct, we established a new cell line of the intercalated cells. Our new cell line of the intercalated cells, which have mineralocorticoid receptor, acid-base–related transporters, and vasopressin V1a but not V2 receptor, made it possible to examine the interaction of aldosterone and vasopressin in acid-base regulation. The purpose of this study is to determine whether V1aR is involved in acid-base regulation via aldosterone using V1aR−/− mice and a newly established cell line of rat intercalated cells expressing V1aR from SV40 transgenic rats. V1aR−/− mice have been generated as previously reported.19–21 Analysis of arterial blood gases and urinary parameters in wild-type (WT) and V1aR−/− mice under basal conditions showed no significant differences in the arterial pH values between WT and V1aR−/− mice (Table 1). However, the blood HCO3− concentration and Pco2 in V1aR−/− mice were significantly lower than those in WT mice, indicating that V1aR−/− mice undergo metabolic acidosis with respiratory compensation. Plasma K concentration was higher in V1aR−/− mice, whereas the urinary pH in the basal condition was lower in V1aR−/− mice than that observed in WT mice. Interestingly, the titratable acid excretion level was significantly larger and the amount of ammonium excretion was lower in V1aR−/− mice compared with the WT mice. Thus, net acid excretion was not significantly different between WT and V1aR−/− mice. Stimulation of urinary acidification by the drinking of NH4Cl showed a decrease in the urinary pH both in WT and V1aR−/− mice, with lower urinary pH levels observed in V1aR−/− mice (Figure 1). The increase in net acid excretion was significantly smaller in V1aR−/− mice because of insufficient ammonium excretion. Interestingly, the blood HCO3− levels were remarkably lower in V1aR−/− mice. These data, which were gleaned under basal and acid-loading conditions, show that V1aR−/− mice are characterized by metabolic acidosis and hyperkalemia mainly as a consequence of low ammonium excretion, which is compatible with type 4 RTA. It is surprising that V1aR−/− mice are susceptible to metabolic acidosis even with a superior ability to acidify its urine, suggesting a significant defect of urinary ammonium excretion. The different effects of acid-load (A–D) and fludrocortisone (E–H) on urinary acid excretion in WT and V1aR−/− mice. The administration of 0.28 M NH4Cl decreased the urine pH (A) and increased the titratable acid (B), ammonium (C), and net acid excretion (D) in WT (dotted line) and V1aR−/− mice (solid line). The increase in urinary ammonium and net acid excretion was greater in WT mice than in V1aR−/− mice. In contrast, fludrocortisones increased the urine pH (E), ammonium (F), and net acid excretion (G) while decreasing the titratable acid excretion (H). The effects of fludrocortisones were more significant in V1aR−/− (solid line) than in WT mice (dotted line). Mean ± SEM. n = 4 to 6. *P < 0.05 and **P < 0.01 versus WT mice; ††P < 0.05 versus day 1. V1aR−/− mice with type 4 RTA were treated with fludrocortisone. Although the urinary pH values in both WT and V1aR−/− mice were increased, the increase in urinary pH in the V1aR−/− mice was remarkably larger than the increase observed in the WT mice (Table 1; Figure 1). The higher levels of excreted titratable acid in V1aR−/− mice under the basal condition became significantly lower after the treatment with fludrocortisone. Urinary ammonium excretion was significantly increased in the V1aR−/− mice. The net acid excretion of V1aR−/− mice was significantly higher than that of WT mice. Although the plasma HCO3− concentration in V1aR−/− mice remained lower than that of WT mice, there were no significant differences in the blood pH, Pco2, Po2, and plasma K concentration between the WT and V1aR−/− mice. These data suggest that the effects of fludrocortisone on the acid-base balance are more pronounced in V1aR−/− mice than in WT mice, suggesting that aldosterone-induced acid excretion could be modulated by V1aR. To examine the key transporters for the induction of type 4 RTA in V1aR−/− mice, Western blot analyses were performed. Notably, the expression of H-K-ATPase and Rhcg was significantly lower in V1aR−/− mice than in WT mice (Figure 2). Treatment of the mice with fludrocortisone restored the expression of H-K-ATPase and Rhcg in the V1aR−/− mice. In contrast, the expression of H-ATPase in V1aR−/− mice was higher than that observed in WT mice. 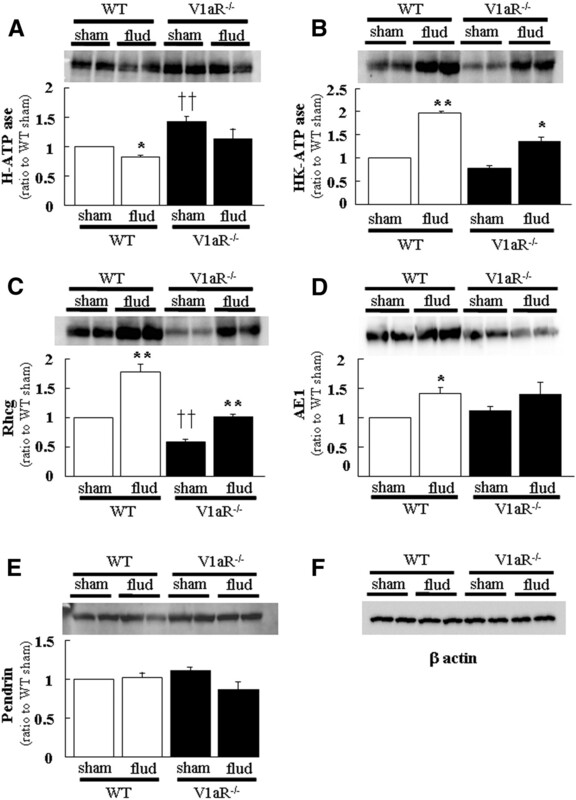 The administration of fludrocortisone decreased H-ATPase expression in WT and V1aR−/− mice; however, this decrease was less pronounced in V1aR−/− mice than in WT mice. These data suggest that the lower urine pH in V1aR−/− mice is dependent on the upregulation of H-ATPase, given that urinary acidification by intercalated cells is dependent on H-ATPase and H-K-ATPase. AE1 expression was increased by treatment with fludrocortisone larger in WT than V1aR KO mice. The expression levels of pendrin were not significantly different between WT and V1aR−/− mice. Smaller physiologic effects of fludrocortisone (flud) on acid-base–related transporters in the kidney of V1aR−/− mice. V1aR−/− mice showed higher expression levels of H-ATPase and lower expression levels of H-K-ATPase and Rhcg than WT mice. Fludrocortisone decreased H-ATPase expression, whereas it increased H-K-ATPase, Rhcg, and AE1expression in WT mice. Effects of fludrocortisones were smaller in V1aR−/− mice. (A) H-ATPase α (116 kD), (B) H-K-ATPase β (67 kD), (C) Rhcg (58 kD), (D) AE1 (96 kD), (E) pendrin (100 kD), and (F) β actin (42 kD). Expression of each transporter in sham of WT was considered as 1. *P < 0.05 and **P < 0.01 versus sham of the WT or V1aR−/−; ††P < 0.05 versus sham of the WT. Means ± SEM. n = 4 to 7. To further examine the role of V1aR in acid secretion by the intercalated cells, a cell line of intercalated cells (IN-IC cells) was established from transgenic rats expressing a temperature-sensitive SV40 large T antigen.22 RT-PCR and real-time PCR analysis showed the presence of mineralocorticoid receptor, 11β hydroxysteroid dehydrogenase type 2, V1aR, H-ATPase H-K-ATPase, Rhcg, AE1, and pendrin, although the presence of V2R, aquaporin 2, and ENaC was not identified, which is compatible with the characteristics of intercalated cells (Figure 3). 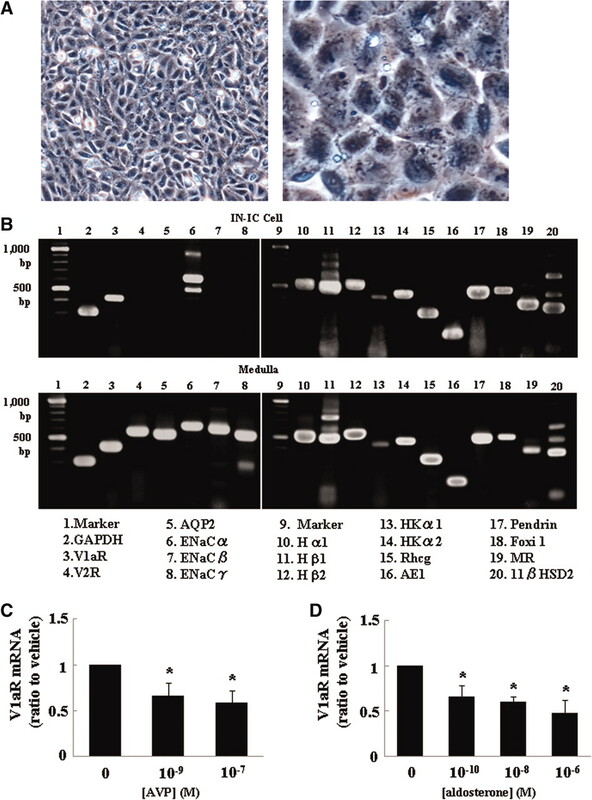 Knockdown of V1aR by siRNA caused a reduction in the level of V1aR mRNA by 70 and 80% after 2 and 6 days, respectively (Supplemental Figure 1). To examine the relationship between aldosterone and vasopressin, effects of aldosterone and vasopressin on V1aR mRNA expression was examined. Aldosterone and vasopressin decreased V1aR mRNA expression (Figure 3). To confirm the participation of V1aR in the regulation of these transporters, the IN-IC cells were incubated for 24 hours with vasopressin (10−9 and 10−7 M) at 48 hours after the induction of V1aR knockdown. Interestingly, vasopressin did not cause any change in the expression of AE1 and pendrin (Figure 4). In contrast, vasopressin increased the expression of H-ATPase, H-K-ATPase, and Rhcg (Figure 4). Although changes in the expression by vasopressin were small, our data showed that H-ATPase, H-K-ATPase, and Rhcg are all V1aR-sensitive and that AE1 and pendrin are V1aR insensitive. IN-IC cells express V1aR and acid-base-related transporters but lack V2R (A) Photograph of IN-IC cells. Homogeneous cells with large nucleus are observed. (B) Expression of vasopressin and aldosterone-related receptors, channels and transporters in the IN-IC cells (top panel), and rat renal medulla (bottom panel). Although all of the examined receptors, transporters,and channels are present in rat renal medulla, V2R, aquaporin 2,and ENaC β and γ were not expressed in the IN-IC cells. Lane 1, size marker; lane 2, GAPDH (308 bp); lane 3, V1aR (425 bp); lane 4, V2R (578 bp); lane 5, aquaporin 2 (553 bp); lane 6, ENaC α (647 bp); lane 7, ENaC β (619 bp); lane 8, ENaCγ (561 bp); lane 9, size marker; lane 10, H-ATPase α1 (Hα1, 510 bp); lane 11, H-ATPase β1 (Hβ1, 503 bp); lane 12, H-ATPase β2 (Hβ2, 540 bp); lane 13, H-K-ATPase α1 (HKα1, 438 bp); lane 14, H-K-ATPase α2 (HKα2, 472 bp); lane 15, Rhcg (307 bp); lane 16, AE1 (178 bp); lane 17, pendrin (488 bp); lane 18, Foxi 1 (516 bp); lane 19, mineralocorticoid receptor (MR, 380 bp); lane 20, 11β-hydroxysteroid dehydrogenase type 2 (11β-HSD2, 361 bp). (C) Vasopressin decreased V1aR mRNA expression in IN-IC cells. Expression of mRNA without vasopressin was considered as 1. 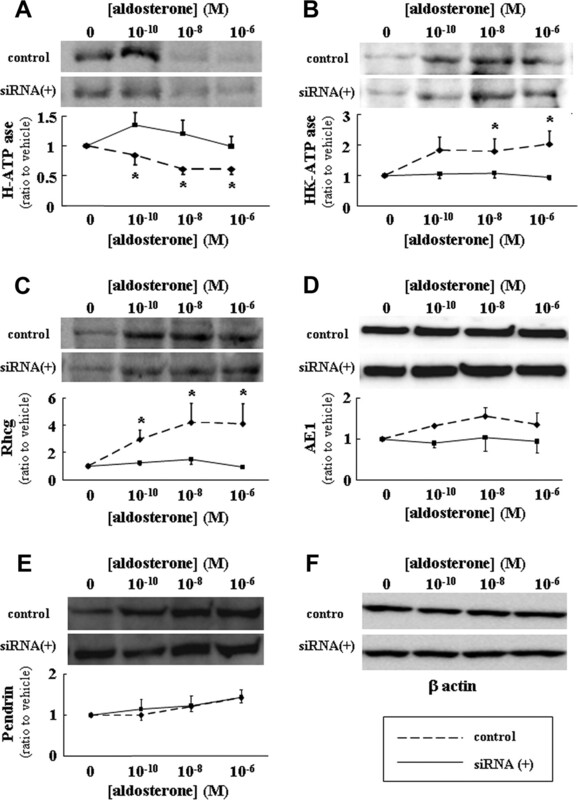 (D) Aldosterone dose-dependently decreased V1aR mRNA expression in IN-IC cells. Expression of mRNA without aldosterone was considered as 1. *P < 0.05 versus without vasopressin (C) or aldosterone (D). Means ± SEM. n = 4 to 6. 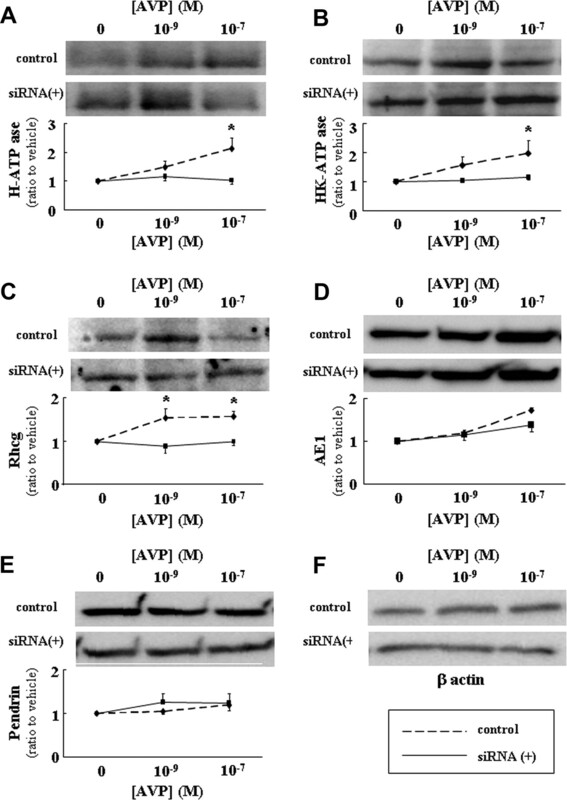 Stimulative effects of arginine vasopressin and inhibitory effects of V1aR gene knockdown on the expression of acid-base–related transporters in IN-IC cells. Vasopressin increased the expression of H-ATPase, H-K-ATPase, and Rhcg in a dose-dependent manner. The effects of vasopression were almost completely abolished by a V1aR RNA interference-mediated knockdown experiment. Vasopressin did not affect the expression level of AE1 and pendrin. (A) H-ATPase α (116 kD), (B) H-K-ATPase β (67 kD), (C) Rhcg (58 kD), (D) AE1 (96 kD), (E) pendrin (100 kD), and (F) β actin (42 kD). Expression of each transporter without vasopressin in the absence or presence of siRNA was considered as 1. *P < 0.05 versus the expression in the absence of siRNA. Mean ± SEM. n = 5 to 9. 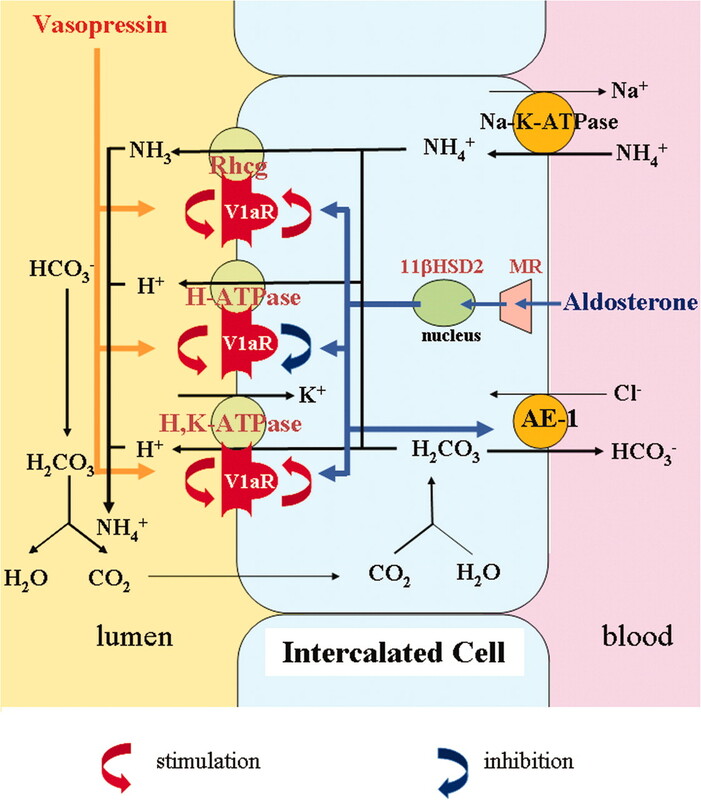 Finally, to examine the effects of aldosterone on acid-base–related transporters, IN-IC cells were incubated with aldosterone (10−10, 10−8, and 10−6 M) for 24 hours after the knockdown of V1aR. Notably, the administration of aldosterone significantly increased the expression of Rhcg and H-K-ATPase and largely decreased the abundance of H-ATPase in intact IN-IC cells (Figure 5). Knockdown of the V1aR gene almost inhibited the effects of aldosterone on H-ATPase, H-K-ATPase, and Rhcg. Although aldosterone slightly increased AE1 expression, knockdown of V1aR resulted in no changes in AE1 expression (Figure 5). Pendrin expression was not altered with aldosterone. These data confirm that, among the aldosterone-related transporters, H-ATPase, H-K-ATPase, and Rhcg are vasopressin-sensitive transporters and AE1 and pendrin are vasopressin-insensitive transporters. Stimulative effects of aldosterone and inhibitory effects of V1aR gene knockdown on the expression of acid-base–related transporters in the IN-IC cells. Aldosterone decreased H-ATPase expression in a dose-dependent fashion and increased the expression of H-K-ATPase, and Rhcg. V1aR gene knockdown abolished the effects of aldosterone on H-K-ATPase and Rhcg and largely inhibited its effect on the expression of H-ATPase. Although aldosterone slightly stimulated the expression of AE1 and pendrin, knockdown of the V1aR did not affect the effects of aldosterone administration. (A) H-ATPase α (116 kD), (B) H-K-ATPase β (67 kD), (C) Rhcg (58 kD), (D) AE1 (96 kD), (E) pendrin (100 kD), and (F) β actin (42 kD). Expression of each transporter without aldosterone in the absence or presence of siRNA was considered as 1. *P < 0.05 versus expression in the absence of siRNA. Mean ± SEM. n = 5 to 9. An important characteristic of type 4 RTA is low urinary pH.18,24 According to the theory of nonionic diffusion of ammonia in the collecting ducts, low urinary pH should stimulate ammonia secretion. This theory has been accepted for many years, but it has been questioned by findings related to Rhcg.25 Urinary ammonium excretion has been shown to be mainly mediated by Rhcg as ammonia and not as ammonium. We found that low urinary pH in type 4 RTA is associated with the activation of H-ATPase and that low urinary ammonium excretion is caused by the decreased levels of Rhcg. Both changes are caused by the functional defect in V1aR, which mediates tubular effects of aldosterone. We classified aldosterone-related transporters into vasopressin-sensitive and -insensitive ones. H-ATPase, H-K-ATPase, and Rhcg are vasopressin-sensitive transporters and AE1 and pendrin are vasopressin-insensitive ones. Such a classification will be very useful for further studies of aldosterone. Our study is the first to assess stimulation of V1aR specifically in intercalated cells. The direct effect of vasopressin on H-ATPase, H-K-ATPase, and Rhcg confirmed the participation of V1aR in the regulation of these acid-base–related transporters given that IN-IC cells do not express V2R. The mineralocorticoid receptor is thought to be localized in the principal cells and non-type A intercalated cells but not in type A intercalated cells in rabbit cortical collecting ducts,26 suggesting that aldosterone stimulates the mineralocorticoid receptor in the principal cells and indirectly affects transporters in the intercalated cells. Our findings of the presence of the mineralocorticoid receptor and 11β hydroxysteroid dehydrogenase type 2 in the intercalated cells clearly suggest that aldosterone directly stimulates expression of the mineralocorticoid receptor in the intercalated cells. Vasopressin and aldosterone are thought to regulate the transporters from different sides of the cell (Figure 6). Accumulated and current evidence suggests that V1aR regulates both the osmo-regulatory V2R–aquaporin 2 system and the volume-regulatory renin–angiotensin–aldosterone system (RAS).6–8,19,22 The mechanisms for the regulation of the acid-base–related transporters by V1aR require further examination. Schematic presentation of vasopressin and aldosterone-induced acid excretion in the intercalated cell. Vasopressin-mediated activation of the V1a receptor stimulates proton secretion by H-ATPase and H-K-ATPase and NH3 excretion by Rhcg. In contrast, aldosterone via mineralocorticoid receptor stimulated NH3 excretion via Rhcg and proton secretion by H-K-ATPase, but it reduces proton secretion via H-ATPase. The presence of V1aR is essential for aldosterone-induced effects on H-ATPase, H-K-ATPase, and Rhcg. Bicarbonate excretion via AE1 is also stimulated by aldosterone. The presence of the vasopressin V1a receptor is essential for the effects of aldosterone. These data showed that the lack of V1aR in the intercalated cells blocks the effects of aldosterone on urinary acid excretion, finally resulting in type 4 RTA. In conclusion, aldosterone requires V1aR for its tubular effects in the intercalated cells. All experiments were approved by the Committee for Animal Experimentation at the Kumamoto University Graduate School of Medical Sciences (19-063 and 20-219) and Hyogo College of Medicine (28036). Arterial blood gases were taken from the abdominal aorta of mice anesthetized with sodium pentobarbital (65 mg/kg, intraperitoneally). Blood pH, Pco2, Po2, and HCO3− were analyzed using an i-STAT Portable Clinical Analyzer 200 (i-STAT). Plasma Na, K, and Cl concentrations were measured at the SRL Laboratory (Tokyo, Japan). Urine pH was measured using a HORIBA pH Meter F-21 (HORIBA, Kyoto, Japan). The ammonia concentration in the urine was examined using an Ammonia Assay Kit (Sigma-Aldrich, St. Louis, MO). The amount of titratable acid was determined by the addition of 1 N NaOH to the urine. The amount of 1 N NaOH required to titrate the urine to pH 7.4 was recorded. The net acid excretion was calculated as a sum of ammonia and titratable acid and was corrected by the ratio to urinary creatinine concentration. 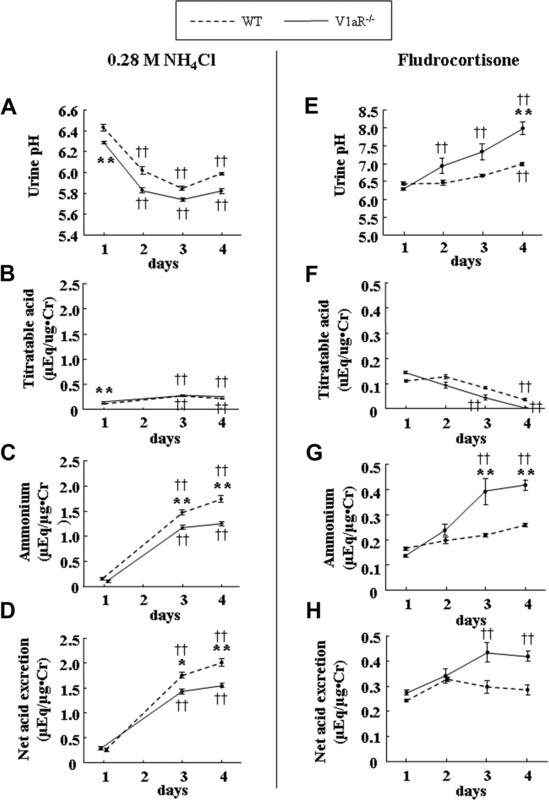 To estimate the level of urinary acidification, WT and V1aR mice maintained in metabolic cages were given free access to 0.28 M NH4Cl for 3 days or intraperioneal injection of fludrocortisone (25 mg/kg per day; Sigma-Aldrich) for 3 days. The new rat intercalated cell line was established from the outer medulla of the kidney of a tsA58 transgenic rat that ubiquitously expressed the temperature-sensitive large T-antigen gene of Simian Virus 40 (SV40; FACT, Sendai, Japan). The slice of the outer medulla was incubated in DMEM/F12 medium (Life Technologies), 10% FBS, 10 μg/ml transferin, 1 μg/ml insulin, 10 ng/ml EGF, 0.5 μg/ml hydrocortisone, 6.5 ng/ml Triiodo-Tyronine, and 1% penicillin/streptomycin. The proliferated cell population was cloned using a cloning cylinder as described in the Supplementary Methods. The characteristics of the new cell line were examined by RT-PCR using the following primers (29,30, and via Primer Blast); GAPDH, 5′-TCCCTCAAGATTGTCAGCAA-3′and 5′-AGATCCACAACGGATACATT-3′ (308 bp in length); V1aR, 5′-AACATCCGCGGAAAGACAGC-3′and 5′-CGGCTCATGCTATCGGAGTC-3, 425 bp in length; V2R, 5′-TACCTGCAGATGGTGGGCAT-3′ and 5′-AGCAACACAAAGGGGGGTCT-3′, 578 bp in length; aquaporin 2, 5′-TGGGCATCGGCATCCTGGTT-3′and 5′-AGCGCTCCTGCAGGCTCTTT-3′, 552 bp in length; ENaCα, 5′-TGGTAGCGATGTCCCGGTCA-3′and 5′-AGGAGGAAGCTGGAGTGGAG-3′, 647 bp in length; ENaCβ, 5′-TCCAGGCCTGCCTTCATTCC-3′and 5′-ACACAGTTGGTGTGGGCCTC-3′, 619 bp in length; ENaC γ, 5′-TCACGCTAACTGCAGTGGCC-3′and 5′-TCTCTAGAGGCACCTGTGCC-3′, 561 bp in length; H-ATPase α1, 5′-TGAACAACCATCGCCACCATGG-3′ and 5′- CGCGCCTCTTCCCATCTCGTT-3′, 510 bp in length; H-ATPase β1, 5′- AACCGGCAGGTCTACCCACCC-3′ and 5′- CCGCTTCCATTCTCAGCAAGCCC-3′, 503 bp in length; H-ATPase β2, 5′-AGAAGTTAGTGGCTCCAAAGC-3′ and 5′-GGGTCATTAGCCAGATTCAAG-3′, 540 bp in length; H-K-ATPase α1, 5′-TCGGGGCACCCCTGAGTACG-3′ and 5′- GGTGAGCGGGTCTGCGGTTC-3′, 438 bp in length; H-K-ATPase α2, 5′- AGACATCGCGAAACGCCGCA-3′ and 5′- GGGGAGCCCAGCAACGATGTA-3′, 572 bp in length; Rhcg, 5′-GCAAGTTGGATATGGTGCAC-3′ and 5′- AACCCCCGAAGCCAAAGGAA-3′, 318 bp in length; AE1, 5′-ACACGCAGAAACTCTCGGTG-3′and 5′-AGCGTGGTGATCTGAGACTC-3′, 178 bp in length; Pendrin, 5′-CATTCTGGGGCTGGACCTC-3′ and 5′-CCTTCGGGACATTCACTTTCAC-3′, 488 bp in length; Foxi 1, 5′- GCCCAACCCTGATCCAGCATGAG-3′ and 5′- GCGGATGGAGTTCTGCCAGCC-3′, 516 bp in length; mineralocorticoid receptor, 5′-AGAAGATGCATCAGTCTGCC-3′and 5′-GTGATGATCTCCACCAGCAT-3′, 380 bp in length, 11β-hydroxysteroid dehydrogenase type 2, 5′-GCCATGGGCTTCACGGTGCT-3′ and 5′-TGTCTCCTGCTGGGCTGCCA-3′, 361 bp in length (sense and antisense primer, and the size of PCR product, respectively). For the control of RT-PCR, renal medulla from Sprague-Dawley rats was prepared. The expression levels of V1aR and 18S (internal control) were examined by real-time PCR using primers supplied by Applied Biosystems (Rn00583910-m1 and Hs99999901-s1, respectively). The knockdown of the V1aR gene was performed in the same buffer containing 10% FBS, 80 nM oligofectamine, and 10 nM siRNA or a negative control siRNA (S128995–7 and 4390843, respectively; Applied Biosystems). To examine the effects of aldosterone or vasopressin, aldosterone or vasopressin was added, and the cells were incubated for an additional 24 hours. For SDS-PAGE, 50 μg of membrane fraction from the kidney or 2 to 20 μg from IN-IC cells were used.6,7 The antibodies for H-ATPase A1 (sc-28801) and Rhcg (sc-100287) were purchased from Santa Cruz Biotechnology. The antibody against AE1 was purchased from Sigma-Aldrich (AV33801). The antibody for H-K-ATPase β-subunit was obtained from MBL (D032-3). The antibodies against pendrin were kind gifts from Dr. Aronson at Yale University31 and Dr. Frøkiaer at Aarhus University.32 The antibody for β-actin was purchased from Sigma-Aldrich. Primary and secondary antibodies were used at the dilution of 5000 to 10,000 and 100,000 to 200,000, respectively, before the detection by Enhanced Chemiluminescence advance (GE Healthcare) using LAS-1000 plus (Fuji Film) in the Research Facility for Common Use in Hyogo College of Medicine. Statistical analysis was performed using paired and nonpaired t tests, Wilcoxon signed-rank tests, or ANOVA with multiple comparison of Dunnet or Scheffe. Dr-SPSS-II (SPSS) was used for the analysis. We thank Yuko Motoyama, Teiko Yonehara, and Kiyo Maeda for secretarial assistance. We also thank the staffs of Research Facility for Common Use and Animal Experiment Facility in Hyogo College of Medicine for helping with cell culture, biologic, and animal experiments. This study was supported by Grants-in-Aid for Scientific Research from the Ministry of Education, Culture, Sports, Science and Technology of Japan (21591064, 19590955, 19590957, 18590895, and 17590833) and by the Science Research Promotion Fund from the Promotion and Mutual Aid Corporation for Private Schools of Japan. Y.I. and K.H. contributed equally to this work. Supplemental information for this article is available online at http://www.jasn.org/.